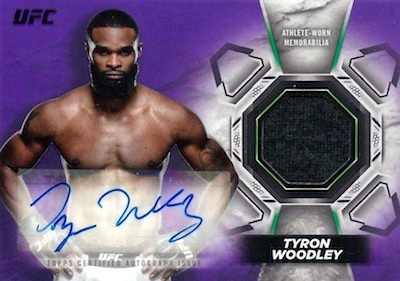 2018 Topps UFC Knockout brings the pain with a format based around autographs and relics. Providing one of each in every pack, all eight hits per box are numbered. This total stays in line with the 2017 MMA set that was also exclusive to hobby. The 2018 Topps UFC Knockout checklist again covers 100 subjects from the sport. Seeing a slightly decreased print run from last year, Green (#/199), Blue (#/99), Red (#/8) and Gold (1/1) parallels combine to fall two per pack. New this year is the Notable Knockouts insert, limited to just 100 copies. Exactly as it sounds, cards showcase 10 of the more memorable KOs in UFC history. 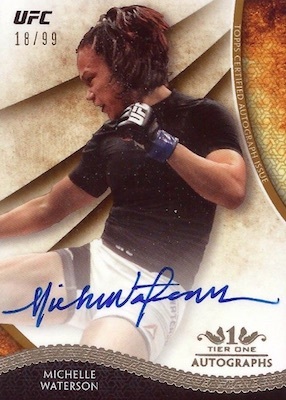 Reminding collectors that MMA hands are not just for punching and submission holds, fighter signatures grace several different designs. Knockout Autograph is the main insert, offering numbered base versions along with Green (#/50), Blue (#/35), Red (#/8) and Gold (1/1) parallels. Again paying tribute to the ornate brand, Tier One Autographs features numbered blue-ink base signatures, plus Bronze Ink (#/25), Silver Ink (#/10) and Gold Ink (1/1). 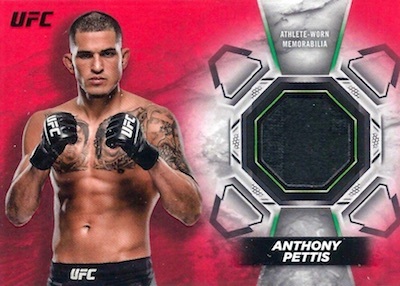 2018 Topps UFC Knockout also unveils the debut for A.K.A. Ink with nicknames for top fighters. The base versions display blue ink and a print run of 25, with additional Bronze Ink (#/10) and Gold Ink (1/1) editions. Combining with standard autographs to drop one per pack, the auto relics contain fighter-worn pieces to provide another collecting element. Knockout Autograph Relic cards come in numbered base, Blue (#/35), Purple (#/25), Red (#/8) and Gold (1/1) versions. Autographed Tier One Dual Relic cards double up on the number of swatches, while Tier One Fight Glove Autograph Relic cards specify the memorabilia item in question. The dual set also has Purple (#/25), Red (#/8) and Gold (1/1) parallels, but the glove version only features one-of-one Gold. 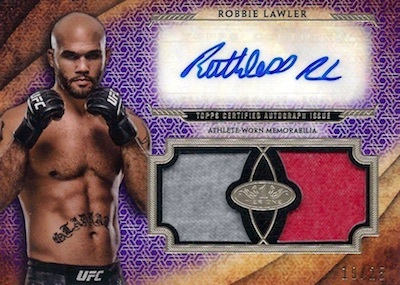 2018 Topps UFC Knockout finishes off the signed relics with rare booklets. These include Bitter Rivals Dual Autographed Relic (#/10 or less) for adversaries, Dual Autographed Tier One Relic (#/10 or less) for those with a connection, and UFC Champion Autograph Relic (#/5) book cards for only the very best. Also coming one per pack and four per box, the UFC release includes numbered Knockout Relic, Fight Mat Relic and Tier One Relic cards. All three memorabilia sets have Blue (#/50), Purple (#/25), Red (#/8) and Gold (1/1) parallels, as well. 2018 Topps UFC Knockout Eddie Alvarez (RUBY RED) (#4 8) AUTO RELIC CARD!!! PARALLEL CARDS: Green #/199, Blue #/99, Red #/8, Gold 1/1. 10 cards. Limited to 100 copies per card. 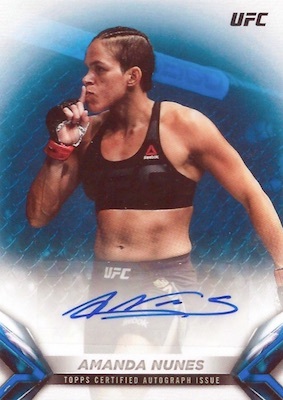 Shop 2018 Topps UFC Knockout Autographs on eBay. PARALLEL CARDS: Green #/50, Blue #/35, Red #/8, Gold 1/1. PARALLEL CARDS: Blue #/35, Purple #/25, Red #/8, Gold 1/1. PARALLEL CARDS: Bronze Ink #/10, Gold Ink 1/1. 13 cards. Serial numbered #/10 or less. PARALLEL CARDS: Blue #/50, Purple #/25, Red #/8, Gold 1/1.